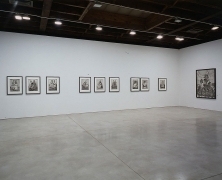 Sean Kelly Gallery is delighted to announce an exhibition of portraits by internationally renowned African photographer Seydou Keïta (1923 – 2001). 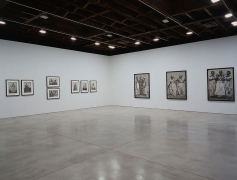 The exhibition is comprised of works carefully chosen in collaboration with the Seydou Keita Foundation, which were taken in the 1950s and 1960s and have never before been exhibited. Although formally posed, the studio portraits are not contrived or pretentious. Keïta often used bedspreads and other readily available material as backdrops for his portraits. He also offered a variety of costumes, accessories and props for his clients to use. Many sitters arrived in their Sunday best, some in traditional tribal costume, others adopted the attire of the western businessmen, while most combined both indigenous and western elements. The photographs capture not only how the sitters appeared, but also how they saw themselves, and how they wanted to be seen by others. 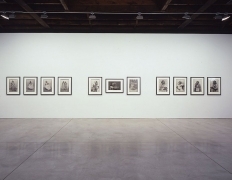 Seydou Keïta, without question one of the seminal artists of the African continent, was born in 1923 in Bamako, Mali. A self-trained photographer, he always preferred the direct control that black and white studio portraits afforded. From 1949 to 1964, Keïta was a studio photographer with a remarkable reputation who meticulously created and preserved thousands of exceptional photographs. While both a historical and sociological record of life in Bamako, Mali, at the time, the photographs capture with immediacy and intimacy the beauty and humanity of the individual. 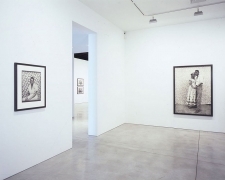 Now internationally recognized as a master of the 20th century photographic portrait, Keïta's work has been exhibited widely in museums and galleries worldwide including solo exhibitions at National Museum of African Art, Smithsonian Institution, Washington, D.C.; Centre National de la Photographie, Paris, France and Fondation Cartier pour l'art contemporain, Paris, France. Recent group exhibitions have included: Roteiros, Roteiros, Roteiros, Roteiros, Roteiros, XXIV Bienal de São Paolo, São Paolo, Brazil; Trade Routes: History and Geography: 2nd Johannesburg Biennale, Johannesburg, South Africa; In/Sight: African Photographers, 1940 to the Present, Solomon R. Guggenheim Museum, New York; Big City Artists from Africa, Serpentine Gallery, London. Forthcoming exhibitions include: The Douglas Hyde Gallery, Trinity College, Dublin, the Museum of Contemporary Art, Cleveland and The Detroit Institute of Art, Detroit. Jean Marc Patras-Delon/N.O.M.A.D.E., Paris, is Seydou Keïta's worldwide agent, and has established a foundation, based in Bamako, Mali, for the preservation, promotion and study of Keita's work.